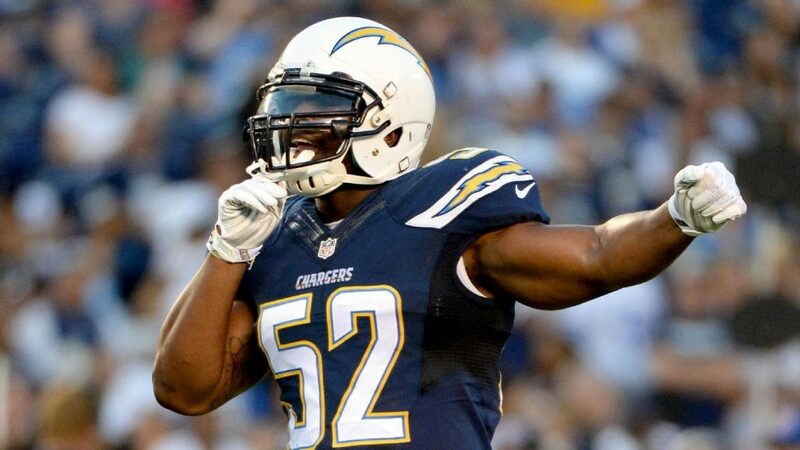 If the Los Angeles Chargers have their way, middle linebacker Denzel Perryman won’t hit the open market when the league’s new calendar year begins, Herbie Teope of NFL.com reports. Ian Rapoport of NFL Media says that the club is trying to sign Perryman to a new deal before the start of the new league year, which is set to start next Wednesday, and if you check any online sportsbooks if he hits the free agent market it would make him that much tougher to re-sign. Perryman has been very good in his time with the Bolts when healthy, but sadly for him as well as the Chargers having him 100 percent has been a huge problem. Last season Perryman played only nine games last year due to a knee injury and he was limited to seven games in 2017 after opening the regular season on injured reserve with an ankle injury. If the Bolts can get the deal done, it would have to come with a raise. Last year Perryman made a base salary of $1 million in the final year of his contract. Perryman has been very good against the run, but again it’s all about being healthy and trying to stay on the field, as playing in just 20 games over three seasons just isn’t going to get it done. That’s not going to stop the Chargers from trying to sign Perryman before next Wednesday, it all know comes down to the offer as well as what the middle linebacker thinks he might be worth on the open market if he chooses to go that route. The Bolts are sitting at number 28 in the first round, and will look to improve the team to try and make a run at the AFC West Title in 2019. 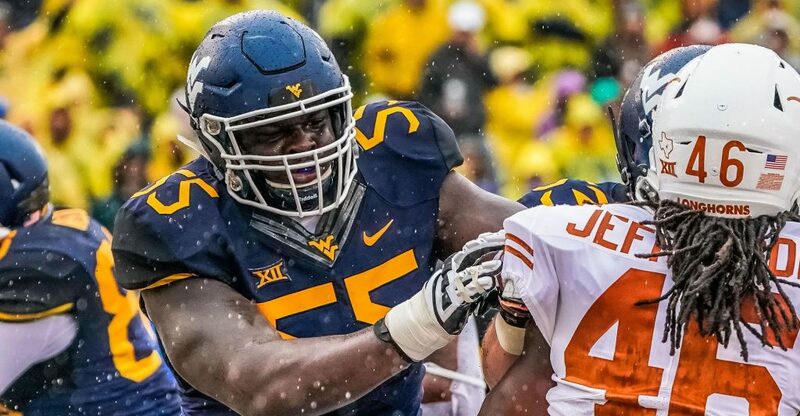 As far as projections go, SB Nation today released their first Mock Draft for April’s big event, and they have the Bolts going offensive tackle in the first round, taking West Virginia OT Yodny Cajuste. 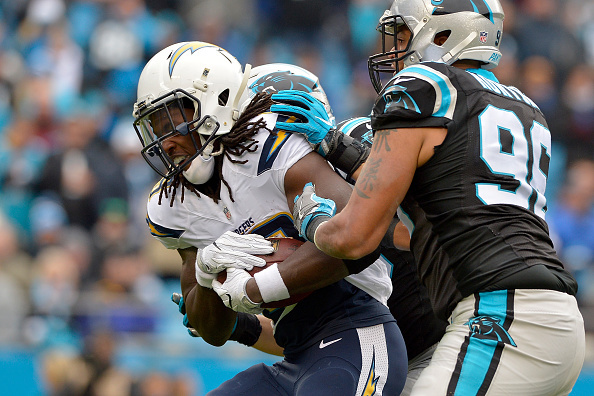 Right tackle turned out to be a big problem for the Chargers with Sam Tevi starting. Whether it’s in free agency or the draft, Los Angeles should seek an upgrade this offseason. That player could be Cajuste, who would have to move to the right side after starting at left tackle last season for the Mountaineers. If Los Angles doesn’t re-sign Darius Philon, defensive line becomes a must. 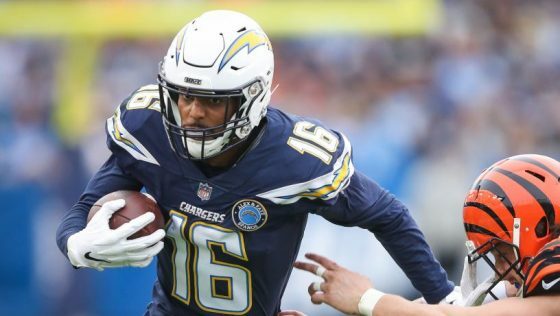 Chargers general manager Tom Telesco admits it may not be ‘realistic” for the team to re-sign impending free agent wide receiver Tyrell Williams according to Eric D. Williams of ESPN. The final injury report for the Chargers wild card game against the Ravens on Sunday is out, and the team got some good news as running back Melvin Gordon was again a full go for the third straight game, and is no longer even on the report. 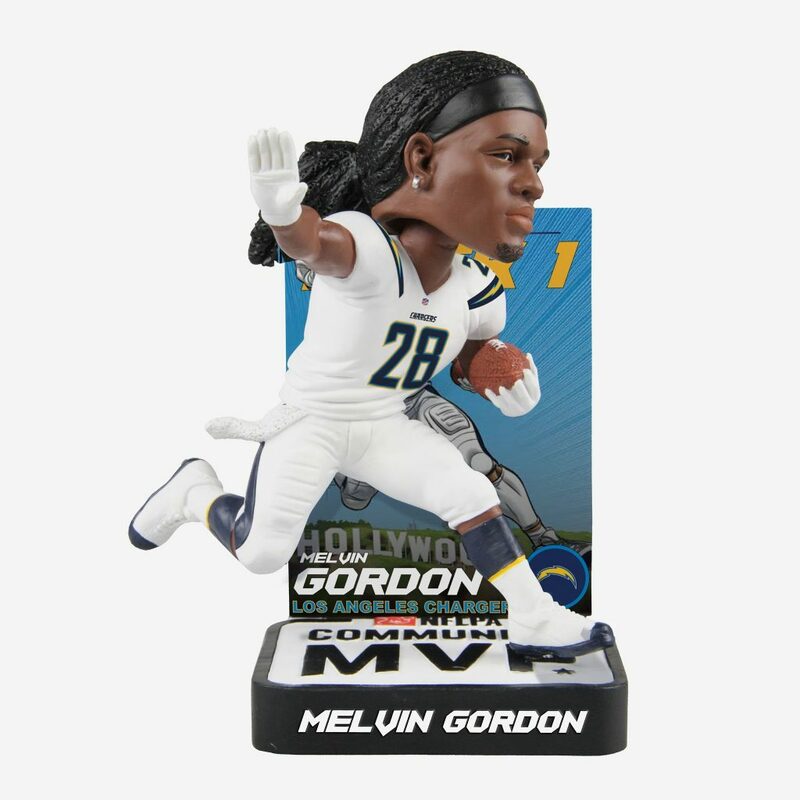 The Chargers are looking to advance in the AFC Playoffs this weekend as they take on the Baltimore Ravens on the road, and today you can get a great Melvin Gordon NFLPA Community MVP bobblehead from Forever Collectibles to celebrate the occasion! All you have to do is simply leave us a comment with your guess of the score for Sunday’s game against the Ravens! Now that the holidays are over, if you are still looking for a perfect gift for that special Bolts fan or have some extra Christmas money and want a great collectible, Forever Collectables has your answer, and they make it easier than ever to get a great item! There’s a ton of great stuff to choose from, like a Chargers light up sweater, or how about a great Bolts mancave sign! Don’t pass up this chance to order these awesome bobbleheads today in time for the playoffs! 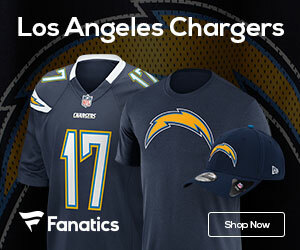 Click HERE to check out the entire Chargers Collection – and if you’re buying for a fan of another team – no worries – Forever Collectables has you covered with EVERY team – click HERE to see their entire NFL line! Don’t forget to leave us your best guess at Sunday’s score, and a chance to take home a sweet bobblehead! Good Luck! 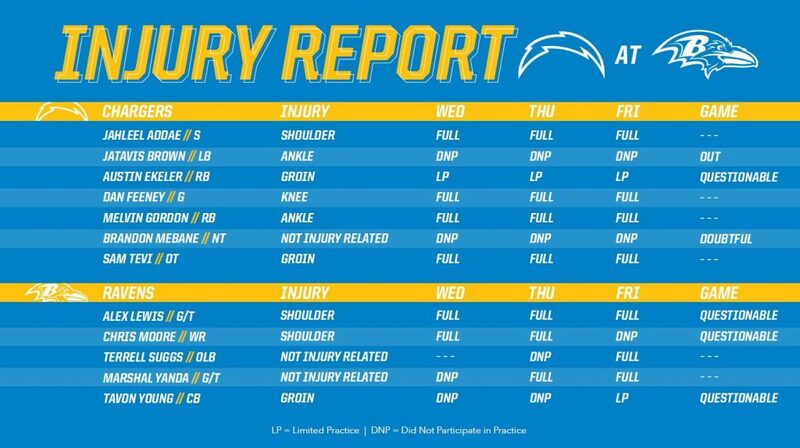 Chargers tight end Hunter Henry returned to practice on Monday for the first time since tearing his ACL in an offseason minicamp according to the team’s official website. 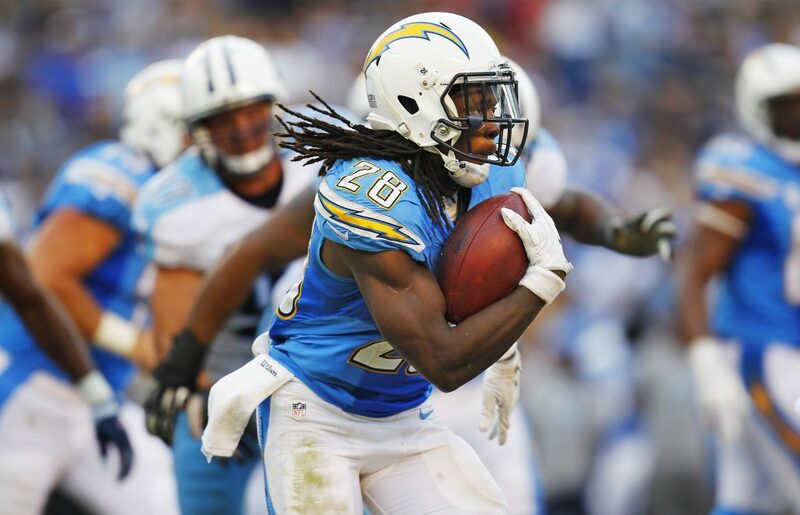 Henry remains on the reserve/PUP list, but there is a possibility the Chargers could get him back for the playoffs. It would be a surprise if Henry were active for Week 17, and he certainly won’t play this week. Henry’s Monday return to practice opens a 21-day window to participate in drills and potentially be added to the 53-man roster. Georgia Tech is targeting a Yellow Jacket alumnus and veteran NFL coach for its vacant head coaching job, Jeremy Bergman of NFL.com reports. 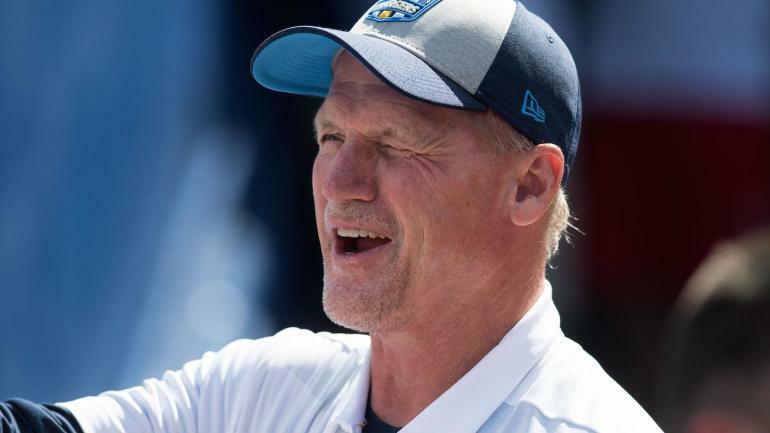 Chargers offensive coordinator Ken Whisenhunt is slated to interview for the Georgia Tech head coaching gig prior to the Bolts’ Sunday night game in Pittsburgh, a source informed of the situation told NFL Network Insider Ian Rapoport.